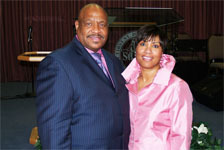 Bishop Kenneth Bernard Spears is a pastor, bishop, author, media personality and community leader. He is a native of Fort Worth, Texas and has served as pastor of First Saint John Cathedral since 1995. Bishop Spears is joined in ministry by his lovely wife Angela and their two sons, Kenneth and Kyle. Kenneth B. Spears answered his call to ministry in 1981 at the age of 17, while a student in the Fort Worth public school system. As a college student, he enrolled at Bishop College in Dallas, Texas and United Theological Seminary in Texarkana, Texas, where he proceeded to earn a bachelor degree. Soon afterwards he earned a master degree from Survine Theological College in Denver, Colorado. Years later he was awarded an honorary Doctorate Degree from Louisiana Baptist University in Shreveport, Louisiana for his service to the community. After becoming affiliated with the Full Gospel Baptist Church Fellowship International in 2000, Pastor Spears served as District Overseer. In 2004 Overseer Spears was appointed to the office of State Overseer for North Texas. In 2005 he was consecrated to the office of Bishop where he currently carries out the duties of the State Bishop of North Texas. From 2012 to 2017, Bishop Spears served as the Bishop of Recruitment for the Full Gospel International Fellowship. In that position Bishop Spears successfully promoted the growth of the Full Gospel Fellowship as it continues to advance into areas where it has yet to be heard, announced or received. Under his annointed leadership, First Saint John has two locations and over 50 outreach ministries. His Be Restored Ministry is broadcast weekly touching the lives of thousands around the world. Bishop Spears is also an author, in his first book The Church’s Finest Hour, he shares from his own journey of discovery, heartbreak and restoration to demonstrate how the church is now experiencing a fine hour. His follow up book, Dark But Lovely, Bishop Spears uses the story of King Solomon and the dark but lovely Shulamite woman who became his queen. He skillfully reveals God’s process of bringing His sons and daughters into the fullness of who He has detined them to be.